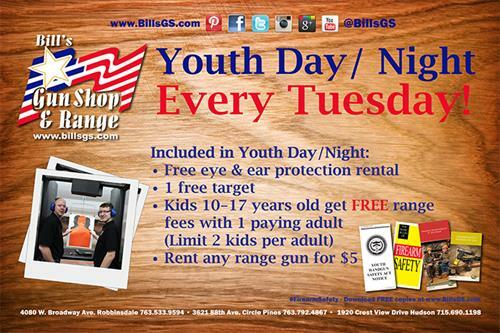 Youth Day/Night is EVERY Tuesday, ALL day, at ALL Bill’s Gun Shop & Range Locations. During Youth Day / Night, we have designated lanes for youth ONLY. Our goal is to create a comfortable environment where everyone can shoot, from the very beginner to the most advanced. One of the greatest things about the shooting sport is that anyone and everyone can participate. Youth Night is designed to be fun, educational, and empowering. We encourage everyone to participate and ask any questions, in a safe non-judgmental environment. No Reservations Needed / Walk-ins welcome! Shooters must be 10 or older to use the range. Shooters between the age of 10 and 17 must be accompanied by a parent, or have a Youth Permission Slip filled out by their parent or guardian and be accompanied by an adult.